I haven't managed to do much here on the blog this week because I've been so busy reading! 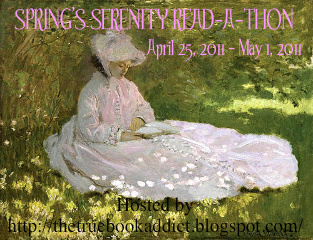 The Spring's Serenity Read-a-Thon, hosted by The True Book Addict, has been going on since Monday, and will end at midnight on Sunday. So far, I've read 509 pages this week. Not a lot for many book bloggers, but on a normal week, I would have read about 100 pages within that time, maybe 200 if I was really into a book or on a deadline. So I've been reading a lot more than usual! I finished Hotel Angeline: A Novel in 36 Voices . I hope to write the review within the next few days. I also read In the Lap of the Gods by Li Miao Lovett. Now I'm reading The Pharos Objective by David Sakmyster. I'll have plenty of reviews to write when I'm done with this Read-a-Thon! I hope if you're participating that it's going well and you're enjoying your reading! Unfortunately, I haven't done much reading this week. With having to move the rest of the stuff out of our house, which was not planned when I scheduled the read-a-thon, I have only had time to manage the read-a-thon and comment on participants blogs. Oh, well...my summer read-a-thon will be in July so I can look forward to that. Plus there is one on Goodreads next week and another one coming up soon as well. I'm glad you're doing great. I hope you've been getting some entries in your mini-challenge. Have a great weekend! I've managed to do MUCH MORE reading than usual, and I've been loving it. When the next one comes up, I'll have full-time classes and probably work, too, so I'll be lucky to get one or two books in. It helps a lot that I don't really watch TV much!